A team of researchers and engineers at Gaumard Scientific has unveiled a new robot that raises the bar on medical training devices. The robot, called HAL, has been made to look like a five-year-old male patient and offers unprecedented training options. HAL not only looks like a boy, he behaves like one. He can track a finger with his eyes, answer questions, cry for his mother and experience anaphylactic shock. He can even breathe faster and/or urinate when scared. And he has also been built in a way that allows doctors and nurses in-training to perform a myriad of tests such as taking blood pressure, checking his pulse and monitoring breathing. Trainees can also use real medical equipment such as an EKG machine or a heart or blood pressure monitor—or tools such as a scalpel or breathing tubes—to perform realistic medical procedures. Gaumard has a long history of producing medical training equipment. HAL is just one of several robots the company offers—others include a robot mother who gives birth and a baby who can experience a wide variety of newborn complications. With HAL, the company has pushed the bar higher than ever before, offering medical students a new level of interaction with a robot patient before being exposed to real ones. Representatives with Gaumard told the press that they actually backed off making the robot look too human—leaving off freckles, for example, or real hair. 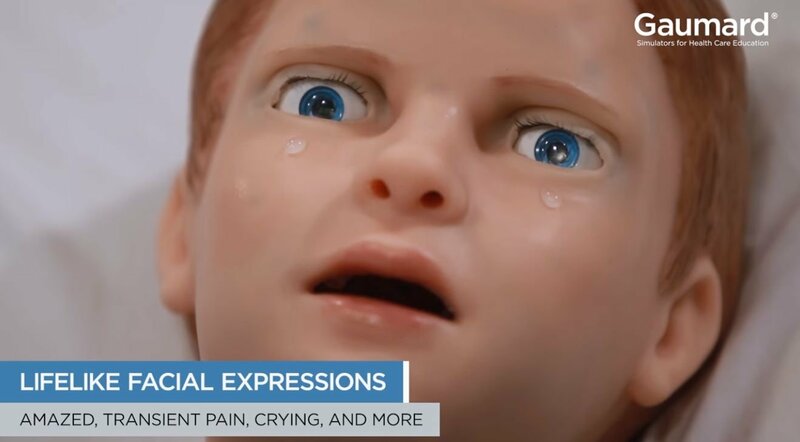 They feared such a robot that could also bleed to death or experience cardiac arrest might be too emotionally traumatic for students just being introduced to emergency pediatric situations. HAL can also be shocked with a real defibrillator or have his throat cut to allow for insertion of a tracheal tube. Trainees can also draw blood and insert urinary catheters or insert a chest tube to allow drainage of what looks like real blood. The makers of the robot have put in special parts at certain body sites to allow for replacement, such as patches of skin that are damaged by a scalpel or needle. And as students perform treatment, the robot can react, crying, for example, or saying “ouch” when pricked with a needle. He might also move, not only showing emotions, but mimicking the difficulty often found when treating a person in pain. Trainers can also speak into a microphone and have their voice come out of the robot sounding like a five-year-old boy—and they can cause medical emergency conditions too, such as arrhythmia, or cardiac arrest, forcing students to react quickly.